[mp3] Jason Boland & The Stragglers: "Somewhere Down in Texas"
How many times have you heard "I like everything except rap and country." If you take country music at face value, that cliched adage probably doesn't miss the mark by much. Yet, because there are so many mainstream "hat country" artists muddying the waters, it's extremely easy, almost a guarantee, that you will skip over the new album Rancho Alto from relative unknown (even for this country fan) Jason Boland & The Stragglers. This is an album where you almost don't want to know anything about who's making it. The production here is impeccable. You can hear flashes of Jerry Jeff, Waylon, and Jamey Johnson. To the understandable lament of his publicist, this artist doesn't fit into the Caitlin Rose, Deer Tick, Tristen world of "indie" country music, and similarly doesn't match the gigantic character of a Jamey Johnson or have a ready-made mainstream country radio hit. 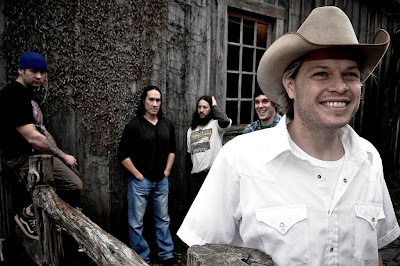 Yet, despite lacking a clear-cut home in this current music landscape Jason Boland and his crack band made a pretty stellar country album - complete with songs about Woody Guthrie and (presumably) the TVA. Not every song on this album is great, and Rancho Alto is not the next Red Headed Stranger. But it doesn't seem Boland strives for that. As his publicist stated, this is just genuine country -- hard-nosed, fun, and ultimately a very rewarding listen.